How do we make the concentrate? We use the same process as you would for making commercial beer, but instead of going through the cooling process and the fermenting and maturing of the beer, we send it to an evaporator once the Whirlpool stage has been completed. A Mill is used to crush the different malts that go into a Mash. The settings on the Mill Rollers and the extent to which the grain husk is broken up are very important when lautering of the wort is undertaken. If the husk is too finely milled, then there will be too much sediment in the wort resulting in cloudy beer. The time and temperatures are specifically set and controlled for each recipe so as to impart unique characteristics to the final beer. 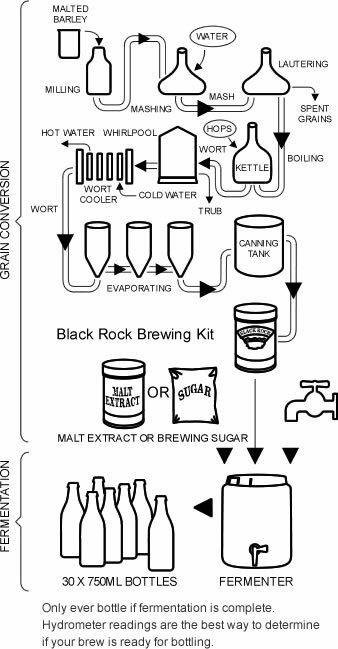 The mashing cycle determines the fermentability of the final wort - for example; dark beers require a lower fermentability giving these beers more body. A lager has a higher fermentability giving the beer less residual sweetness allowing the hop bitterness to prevail. From the mash tun the wort is separated using traditional European lautering methods. This process involves straining the liquid wort from the mashed malt with subsequent hot water rinses of the spent grain. The wort is collected in the kettle where a selection of fresh hops is added for bitterness. Late hops are then added for aroma. In each case, only fresh hops are used. During the vigorous kettle boil the bitterness component of the hops (alpha acids) is isomerised giving the final beer its bitter characteristic. At the end of the boil, more fresh hops are added to give the beer its aroma. These aroma hops are high in specific aromatic oils. A vigorous boil also removes unwanted volatile compounds and causes the protein to denature and settle out. The boiled wort is transferred from the kettle to the whirlpool where a circular motion of liquid is formed allowing the protein and used hop material to settle to the bottom from where it is removed. The wort is then concentrated at this stage by removing 80% of the water in a gentle three stage evaporator. Temperatures are kept low to prevent darkening of the wort. This stabilises the wort ready for packaging. Then, you, the brewer just add back your water and continue with fermentation to make your own fine beer.